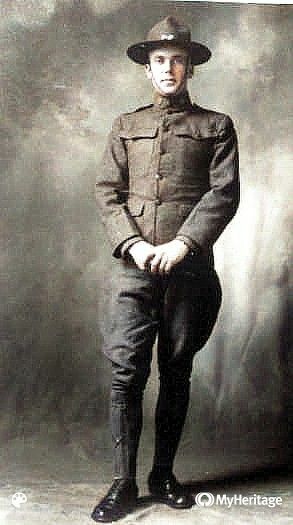 In 1917, when the United States joined the War, one John Ernst Schroeder enlisted late in 1917. He had an idea to make a little money at the same time he fought for his country. He purchased a camera and took it with him, with the idea of taking orders for some of the pictures he would take from his comrades. When they returned to the States, he would fill the orders and sen them their pictures. When Dr. J. E. Schroeder died in 1977, we found several sets of photographic prints and the negatives in his old WWI Kit Bag. I guess some people didn't follow through on their order? Any way, there were 4 sets of prints. One set went to his son, Rev. Victor J. Schroeder in a Scrap book, one set went to the Military Historical Museum in Pennsylvania (I believe) and I ended up with 2 sets. It is these pictures that make up the bulk of this web site. Although the censors did not allow him to take pictures of the actual fighting, there are many pictures depicting the comradery developed in a military unit, the daily life of a soldier, the scenery of France and Germany in 1918 and 1919, and the daily life of the German people in Southwestern Germany. Take some time and travel back over 80 years to a time and way of life much different than we know today. DEC. 5, 1918 IN BERDORF, LUX. DEC. 15, 1918, IN PRUM, GER, Ist TIME ON A BED SINCE U,S,A.